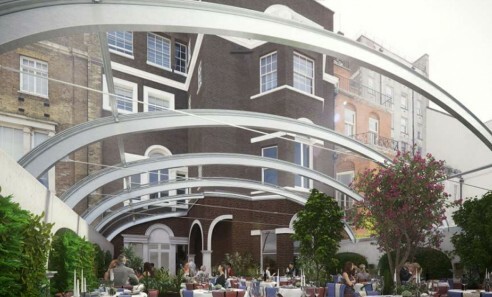 As part of a major makeover of the famous Mayfair private club, Annabel's, Qualter Hall, in conjunction with Waagner Biro, secured the contract for a fully glazed retractable roof at the club's new 46 Berkeley Square location. The moving roof provides cover for a glamorous, all weather Courtyard terrace. The Courtyard is 12.5m wide by 13m long, the roof is composed of five arches that retract towards the Mews building and two arches that retract towards 46 Berkeley Square. Qualter Hall's scope, completed in January 2018, comprised manufacture, delivery, site installation and commissioning for the roof, including design and supply of the complete electric chain actuator drive systems with controls and supply of the stainless steel structure with associated parts. The new Annabel's opened in March 2018.